I am Martina, a culturally-responsive educator, trilingual grammarian and enthusiastic Yoga terminologist. 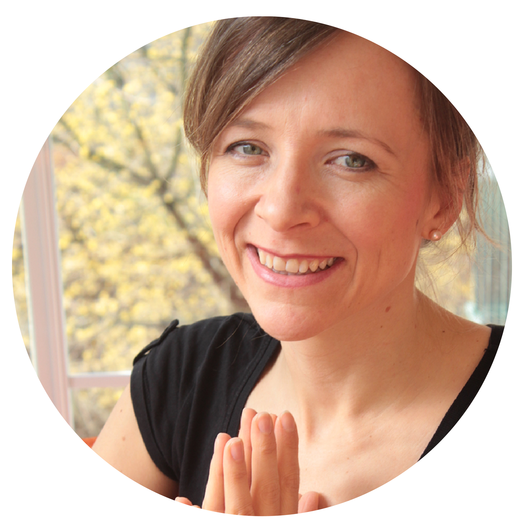 I am based in Vancouver, BC where I teach Yoga to people with English as a Second Language. I create. 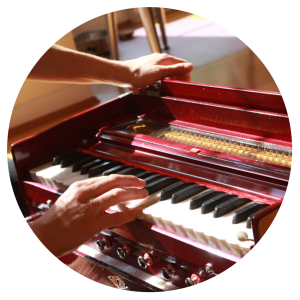 I create resources for Yoga teachers about translating cultural awareness into teaching Yoga. I believe teaching Yoga in a multicultural environment such as Vancouver requires us Yoga teachers to be culturally competent, sensitive and responsive. To provide optimal health care, a physician needs to be aware of how their patients’ cultural backgrounds shape their believes about health care. Similarly, we need to be aware of what cultural beliefs our students bring to their Yoga mats to serve them optimally. And as a former high school teacher and English as a Second Language I could not help but write a curriculum for English teachers who would like to teach English through Yoga. I have put 8 years of teaching Yoga in multicultural environments into my ebooks and teaching materials. I used to teach Yoga and ESL classes for international students who are in Vancouver to study English. Either their English teacher brought them to me or the students had been sent by a student placement agency. Most of these students had little to no experience with Yoga, so I got to see what benefits even just one Yoga class can make to their well-being and mood! This was the most exciting part of my work! 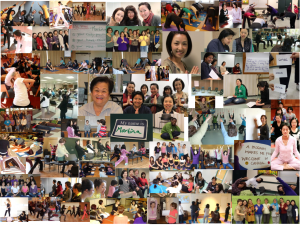 I also taught ESL Yoga as a guest teacher in programs for multicultural women. This work took me into many non-profit organizations and neighborhood houses. There I witnessed how people from different cultures met, stretched and breathed together – also often for the first time! Nobody ever complained about my classes being too difficult or too hard to understand. This was because I adapt the practice of Hatha Yoga so that it was culturally and linguistically sensitive to the needs of newcomers. Before ESL Yoga I have taught countless “all levels” classes at most major Yoga studios in Vancouver, the most multicultural city in Canada. And I feel this approach serves the long time locals of Vancouver very well. However, it does not serve speakers of other languages such as international students, immigrants and refugees who have special linguistic and cultural needs. This is why I created ESL Yoga®. Also, I simply love designing teaching resources which compassionately break down cultural and language barriers within and between people. The physical, cultural and linguistic openings that I achieve with ESL Yoga positively impact my students’ life which in turn flows into our local and global communities positively too. At this my heart sings! I have taught my first “public” Yoga class in my living room to a couple of friends. Now I focus on creating more teaching resources and professional development books for ESL and Yoga teachers. Until last year, my clients were ESL schools, non-profit organizations who run programs for immigrant women, multicultural communities and international students. And I partnered with student placement agencies and ESL schools who serve the international student community of Vancouver. I have also worked with clinical therapists to help students recover from post-traumatic stress disorder (PTSD). These programs were federally funded cross-cultural mental health programs. I have also been hired by the Crisis Center for Suicide Prevention to develop and pilot a program on active mindfulness practices in primary schools. I have emigrated, experienced culture-shock and homesickness and gone through the ups and downs of cross-cultural adaptation four times. These experiences left me wishing I had a better understanding of wellness in general and how to create well being for myself regardless of external conditions – and how to make friends in a culturally diverse environment. I was born and raised in Germany, studied in France, lived and taught in the UK, Canada and Japan. I’ve been living in Canada for eleven years, and I am now settled in Vancouver with my husband and dog. Other than Yoga, I now have many other practices which I love and which help me get through the occasional pang of homesickness: I run and play a red harmonium, and I love cooking Ayurvedic foods. ESL Yoga is my creation. However, it would not exist had it not been for the inspiring teachings that my teachers passed on to me from their teachers. My students are always slightly aghast when I tell them that I “still” attend public Yoga classes and teacher trainings. Often they ask, “Why do you still take trainings and classes? You are a teacher!” Yoga is a lifelong process, and there is always more to learn. That is why I am a student and a teacher. And I have been lucky enough to study with the world’s best teachers in Vancouver, the United States and Europe! I trained and taught so much that I qualified for the “experienced” level with the Yoga Alliance and received scholarships for my dedication to learning and professional development while I was teaching at Yyoga. For a full list of all trainings I completed click here! You will see that most of my training is in Anusara Yoga, a therapeutic form of Hatha Yoga I was affiliated with between 2009-2012. I completed my basic 200-hour Yoga teacher training at the Vancouver School of Bodywork and Massage. I served as an apprentice at a Power Yoga studio here in Vancouver for three months, hold a Yoga ed. certification, and have completed specialized trainings in how to teach Yoga for PTSD. A terminologist studies words (terms) and their use. Language or rather languages – I know, care for and love three – have always been the heart of my work. I love looking at the use of language in Yoga through they eyes of an English teacher and linguist.